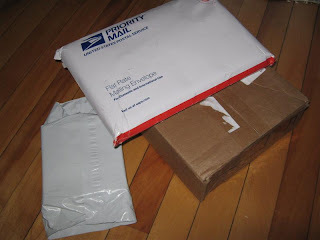 I've received a ton of goodies in the mail recently! 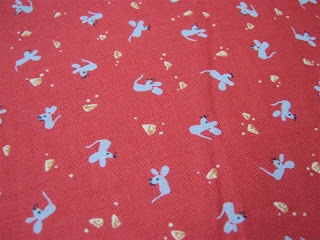 Check out these cute mice with cheese! 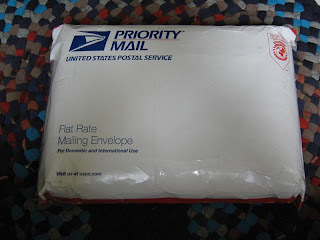 4) Just last week, the last parcel arrived, oh, so exciting! 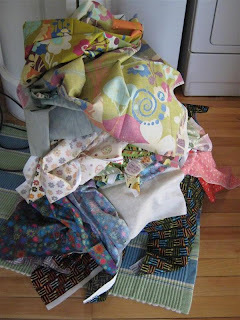 Now compare the laundry pile to the photo of the folded fabrics at the beginning of the post. 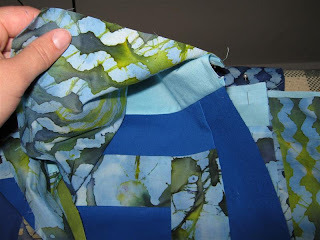 I always forget how much more room fabric takes up when unfolded, my poor washing machine almost gave up, as I was adding the fabric to my normal wash at the end of the cycle and hadn't planned enough space. 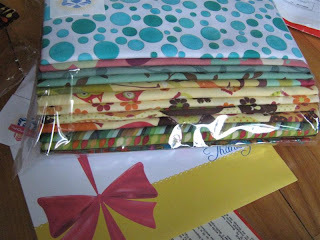 But I really really wanted to get the fabric ready for sewing! 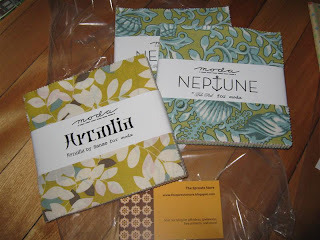 So all along I've been blogging about my Wildflower Serenade baby quilt when in fact the fabric line is Northern Solitude - Wildflower Serenade was the other charm pack I bought that day. I'll edit the previous posts to get that right! 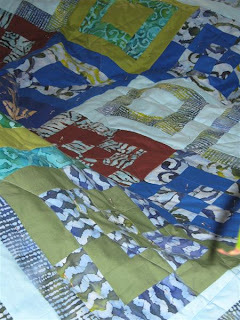 Back to the baby quilt. 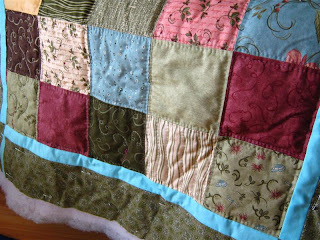 I've been hand quilting on it while on the phone and watching movies when I needed a break from the wedding quilt. Saturday evening, it was beautiful again, but too hot in my apartment, so I headed out to a nearby park, quilt and book in tow. 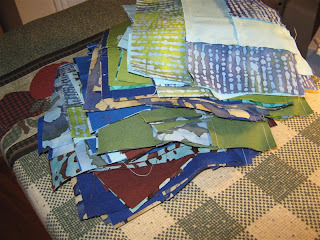 It was great working on a small quilt outside; I switched between the book and the quilt and spent two lovely hours outside! Summer Dress For This Year??? 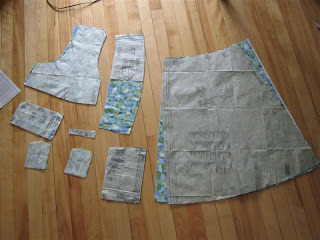 Last Saturday, I decided to work on my summer dress. 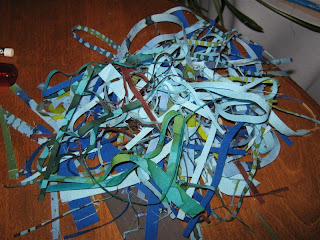 I laid out all the pieces I've cut. Looks nice, no? I read the instructions again. Very confusing still. Some people have indicated I need a second machine. I pointed out that I don't even have a good table for my first machine, nor do I have the space for said good table. So the answer is: The dress has to wait! 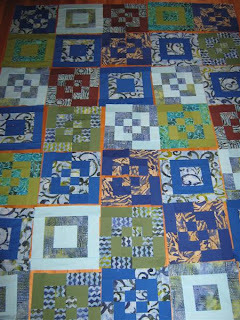 The Northern Solitude [previously referred to as Wildflower Serenade] quilt has been a great diversion from all the wedding quilt deadline-quilting. 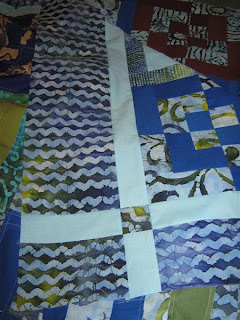 I pinned this quilt last week and decided to hand-quilt it. 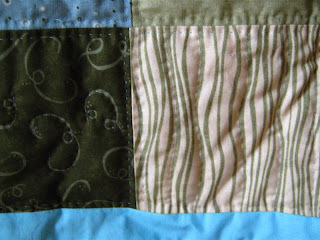 I've realized I really cherish the silence of hand-quilting. 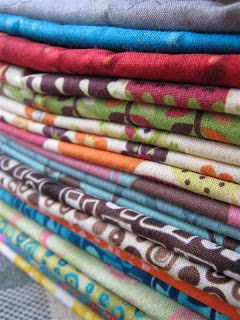 I can listen to a favourite radio show or talk on the phone, all big no-nos with machine quilting unless I annoy the neighbours and blow my speakers, or alienate the people at the other end of the phone line. I settled on outlining every block about 1/4" from the seam and also outlining any existing patterns of each block, so dots, swirly lines leaves. I finally finished the quilt top for the wedding quilt on Friday! 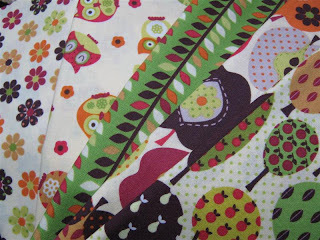 This is one of my favourite batik fabrics in the quilt. I like the blue on the left, too. for a couple, look at all the overhang! 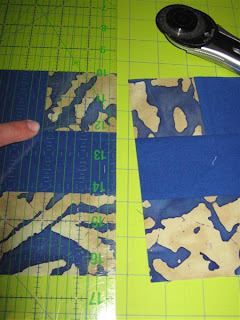 Very importantly, I've learned to prepare my binding strips BEFORE I start quilting, so I don't have to switch sewing machine feet over and over in the end. Easiest to just leave the walking foot on to attach the binding. 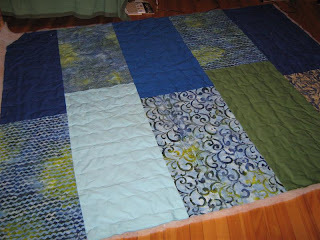 I put together a quilt back by Saturday afternoon and had the massive thing pinned by the evening. I had to move furniture in my living room to get enough floor space to spread it out. That gave me great incentive to get it pinned and out of there quickly, so I could walk across the room again! I also didn't have batting that was big enough, so I had to piece it... I used to do this by tongue-and-grooving the batting, i.e. 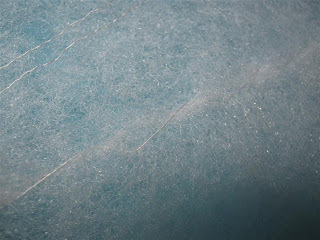 splitting about 2" of the edge of the batting on either edge to be joined, removing one of the split layer on one edge and nestling the remaining layer between the two layers of the other edge. Just like tongue-and-groove flooring. 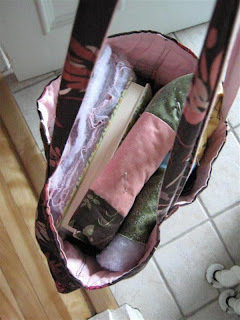 Then Amandajean of CrazyMomQuilts showed how she sews batting together. 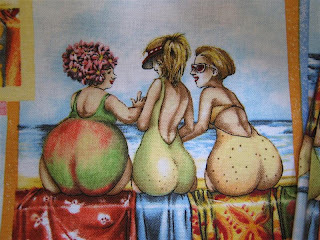 I tried that on a couple of quilts and it's never left a lumpy seam, so that's what I did here. 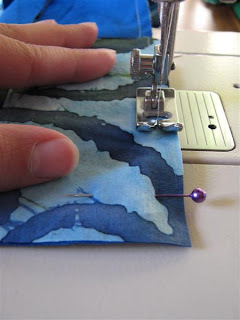 AmanadaJean now sews the batting by machine, but I couldn't do that with polyester batting, obviously. 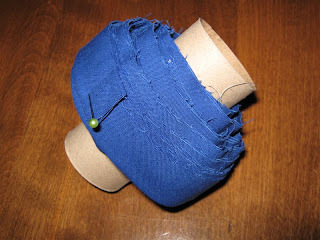 So hand-sewing it is. Fairly simple and quick, though. 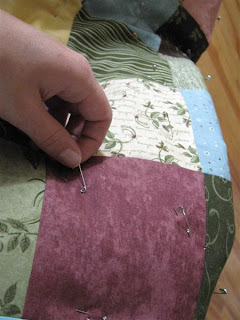 It took 477 safety pins to pin the quilt. My poor finger nails got quite a beating from all the pushing and closing of pins. Check out my neat 4" pin placements! 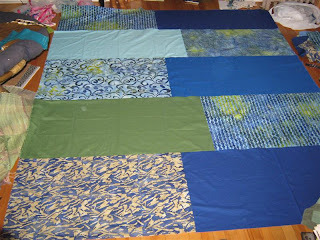 I briefly considered quilting a 4" grid on this quilt, it would look neat on the back. 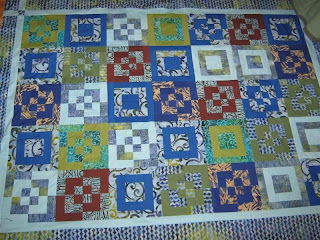 But because people are supposed to look at the front, I'm quilting straight lines criss crossing all-over, as inspired by some of the blogs. The criss-crossing lines make me think of the wedding couple's paths in life having crossed, and the vast choices of which new paths to follow that lie ahead in their future. 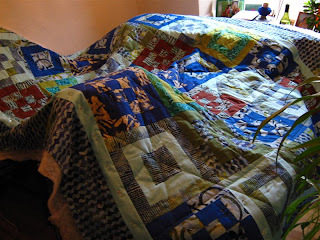 I sitll can't get over how big this quilt is. 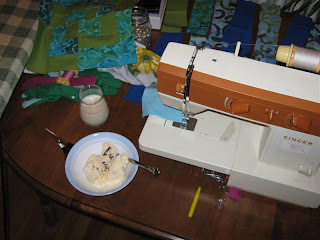 Here it's covering my dining/quilting table, machine, chair and ironing table like some invasive overgrowth. Okay, below it is, the long-awaited Bento Box Tutorial. It's huge! 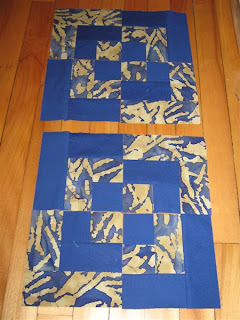 (both the quilt and the tutorial!) I hope it's not too convoluted, I've tried my best explaining and photographing! 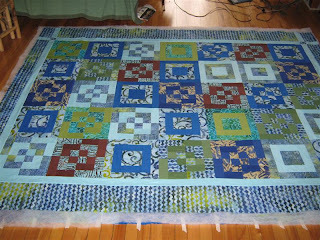 Phew, now that it's done, I'll put all my energy into finishing this wedding quilt... 8 days left. 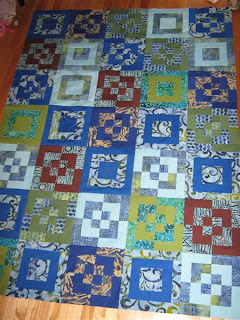 This was supposed to be my first tutorial, but the Baby Wheely quilt was finished much faster than this full sized quilt, so now it's my second. 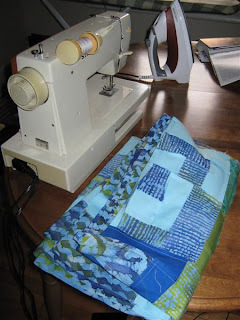 And with that comes a belated word of warning: I'm sure I don't know half the technical terms used in quilting, so I've tried to illustrate wherever I can! 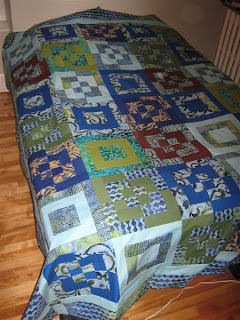 I've made this quilt, so the measurements all work. 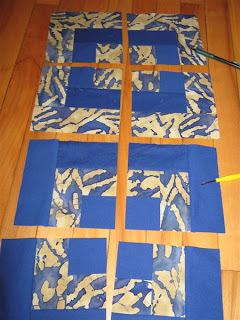 I also thought I was oh-so clever to have thought up the method of making a block, cutting it up and realligning it for a bento box quilt, but I've recently read some references to this on other blogs, so I guess I'm not so special after all *grins*. Enjoy and if you have any questions, comment away, of course! 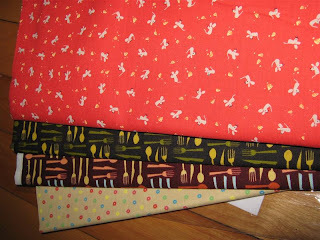 Choose your fabrics, whichever fabrics you want, as long as the two colours you choose per block are contrasting - this gives the best effect for the bento box. 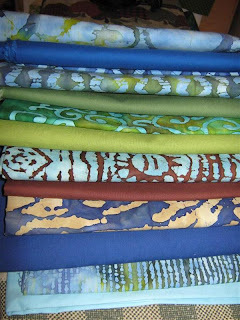 But of course, fabric choice is always up to your creativity. 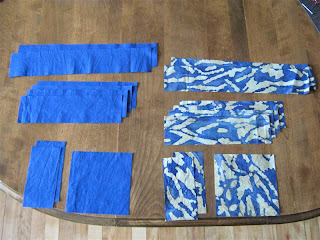 There are lots of wonderful examples of bento box quilts online, whether they use just two colours throughout or many different colours. 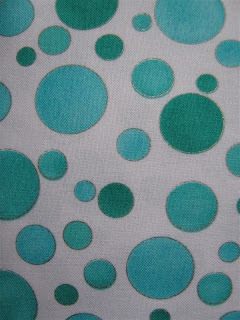 I always use 100% cotton fabrics and try to match fabric heaviness/density. 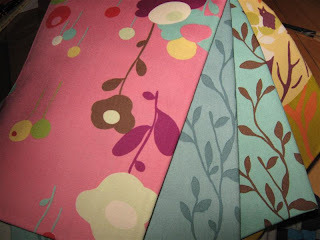 Choose two colours to go into a block and cut a 5" strip of each fabric. 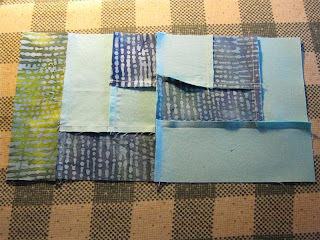 Off this strip, cut a 5" piece (for one 5x5" square per colour). 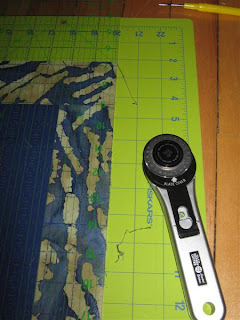 Cut the rest of the strip in half lengthwise for two 2.5" strips. Lay these on top of each other and cut at 13", 9", 9", and 5". Do this for both colours. 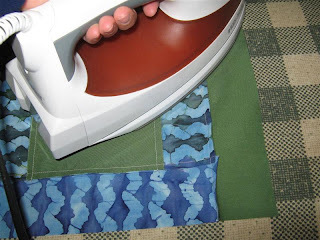 Make sure that you have alternating colours in each square "ring" and that you always add your border strips to a side with seams! 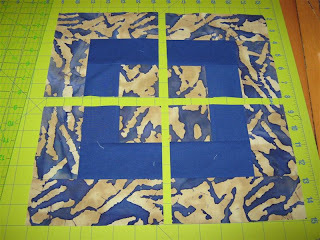 That might sound weird, but it means that if you start by adding the first border (the 5"x2.5" pieces) to the sides of the center square, then add the first strips of the second border to the side as well. 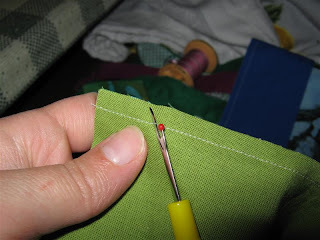 I sometimes use pins to keep the edges of my fabric pieces straight and avoid stretching. 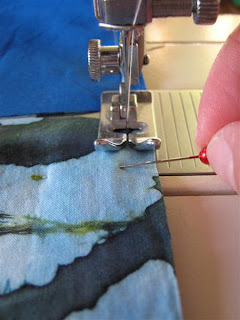 If you pin, make sure not to sew over the pins, that can cause machine damage and injury to you. 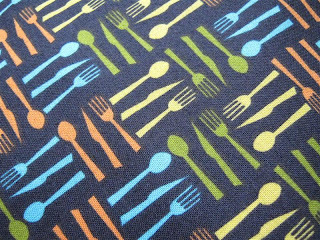 Because I made this pattern up as I went along, I didn't consider seam direction during pressing. 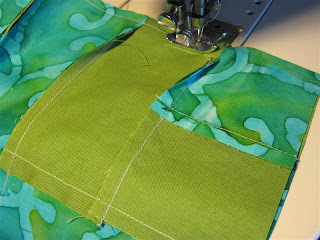 If you press your seams open, you won't have a problem with this, but if you press seams to one side then you should press all your seams in the same direction per block. 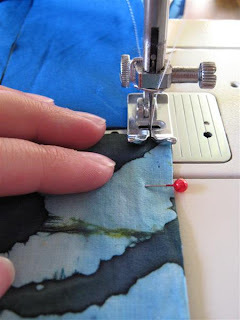 For example, press all horizontal seams up and all vertical seams left. 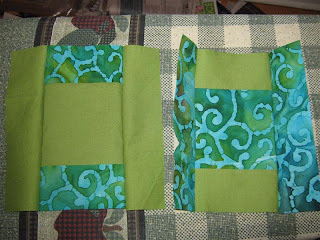 Because I pressed every seam towards the outside of the block, I ended up having to switch pressing direction when I was making my final bento box block. 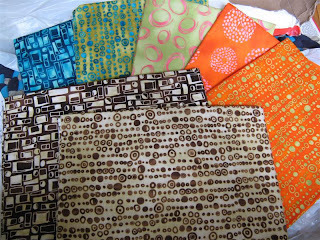 This will make my quilt lumpier, but I'll have to live with that, rather than 6 fabric layers where seams are pressed in the same direction! 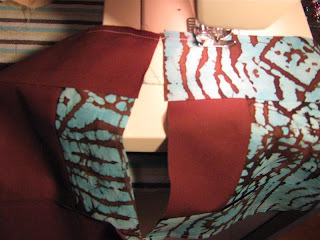 And I didn't do this for illustrative purposes, I actually didn't notice four wrong seams, oops! 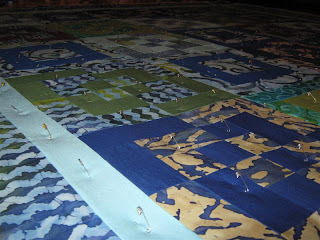 I string all my blocks-in-progress together to save time (no snipping of thread all the time) and thread. 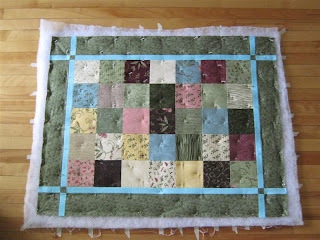 Just make sure you are doing the block right, or you'll end up with all your blocks being wrong ;) It's safest to do one complete block first to make sure all the measurements and seams are working. This is optional at this stage, because the outside of the block doesn't matter yet. 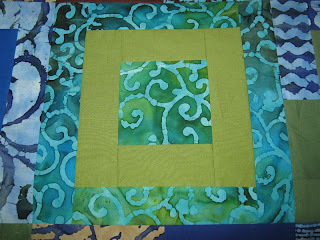 I often don't trim my blocks at all, but it can save some hassles when you're finishing your top, especially if some blocks really come out wonky. 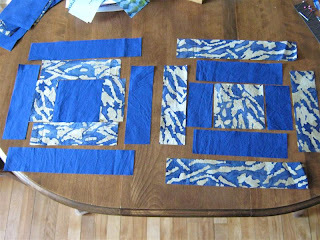 I usually try to work as diligently as I can when piecing, so that I can save the tedious work of measuring and trimming blocks. 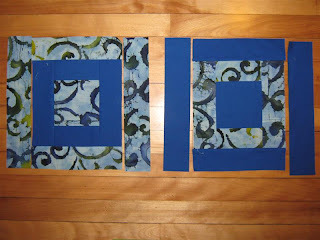 If you do trim, measure all your blocks and trim them to the size of the smallest block. You shouldn't have to trim more than 1/4" - 1/2". 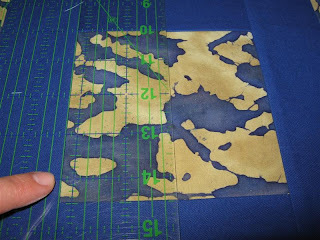 If that is the case, either redo the block, and carefully check out how you do your 1/4" seams while sewing, or live with smaller blocks and less proportional borders. 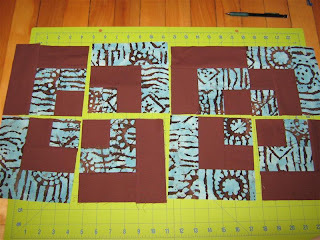 If your blocks are squared up nicely (i.e. 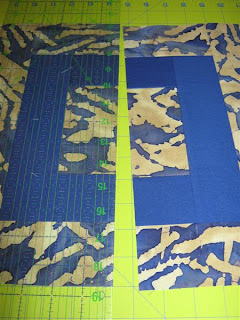 each border is at right angles) you can line your ruler up with a seam parallel to the edge of the block as you see in the photo below and use that as guide to get a straight edge. 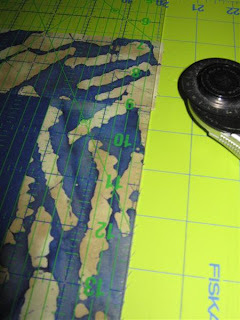 For the next edge, turn your block clockwise, line a horizontal ruler line up with the bottom of your block (the edge you just trimmed) AND with the parallel seam and trim the next edge. Keep rotating two more times and you're done. There wasn't a lot to trim off this block, just the bit on the top corner, but I've had other blocks that needed more trimming! Don't forget to re-charge on some treats in between! 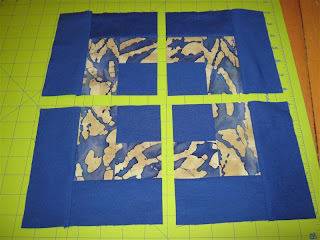 Now it comes to switching the squares to make the bento box block. 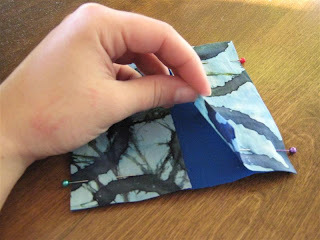 This is just a bit tricky if you care about symmetry and want the seam on the corners of your quilt to all have the same orientation. 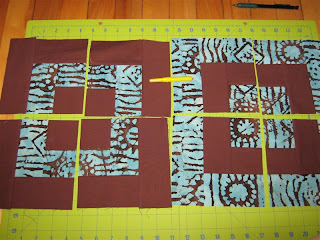 With that I mean: as you follow each border, you want to see a long piece, then a short piece, then a long piece etc. 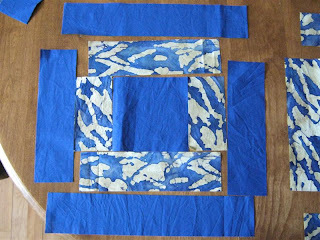 In these photos, I'm pointing out which pieces I switched, and you can see how in the end, each bento box block is made up of identical squares (in terms of layout), and the two blocks go in different directions. Sorry if I'm confusing, I've never realized how difficult it is to describe these things in writing. Let me know if you have questions! 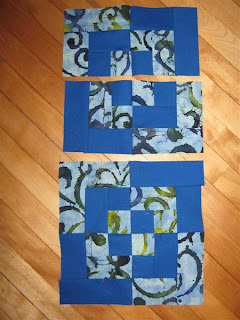 Sew your 4 block pieces together as you would a four patch: make two rows,then join the rows. 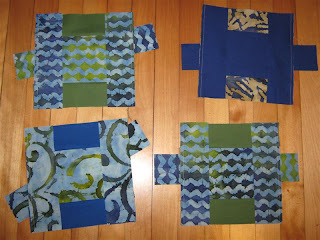 For my quilt, I decided to keep some blocks uncut to have a mixed-block bento box quilt. It seemed a bit too busy. I trimmed all the final blocks to 12 1/4", the smallest common denominator, and laid them out all mixed together before assembling the rows. 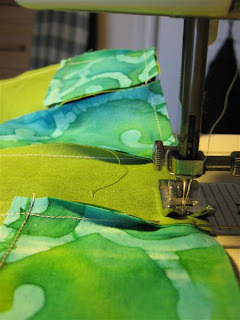 Sew each row together, nestling seams where possible, then join the rows. Mark your rows with numbers and don't work when you're tired, or you mess up the order like I did. 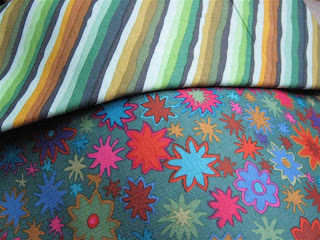 I liked the original layout better, but by the time I noticed, I had gone too far to rip all the seams out. 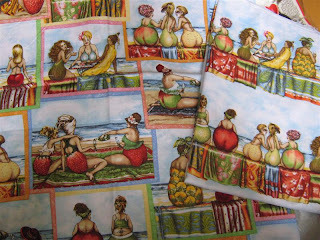 Join A to B along 2.5" wide side four times. Join C to D along 7" wide side 4 times. Join one CD piece to the right side of an AB piece (two times) and to the left side of an AB piece (two times). See the photo for this to make more sense. 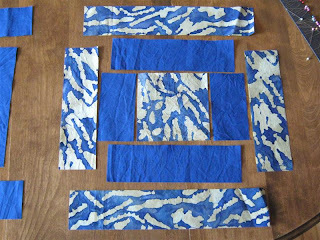 These are for the top left and bottom right corners of your quilt. 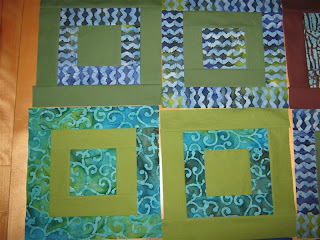 These are for the top right and bottom left corners of your quilt. 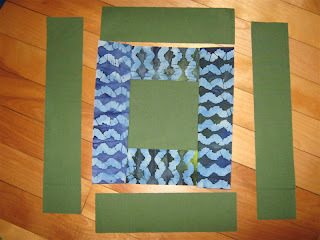 Join the pieces to each side of your top and bottom border. 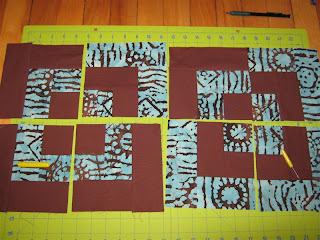 Make sure you join them in the right arrangement, so the 2.5" wide pieces should be the side you join to your border every time. 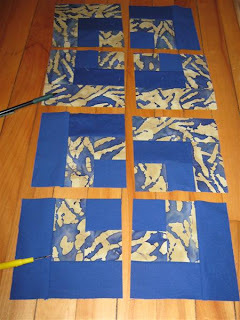 Sew the blue inner and batik outer borders (same length) to the sides of the quilt first. 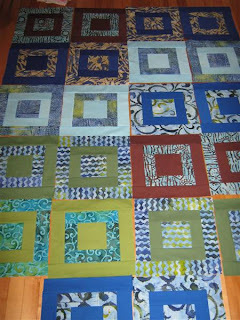 Prepare the entire width of the top and bottom borders (including the corner pieces) and join to the quilt last. 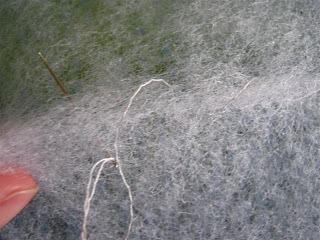 All that's left now are the backing, batting and binding - and I leave those entirely up to you!